U.S. average insurance prices for a Nissan Rogue are $1,400 every 12 months including full coverage. Comprehensive costs an estimated $268, collision costs $512, and liability is estimated at $440. Liability-only coverage costs approximately $510 a year, with high-risk coverage costing around $3,030. Teenage drivers pay the highest rates at $5,328 a year or more. Rates are based on $500 comprehensive and collision deductibles, liability coverage up to 30/60, and includes uninsured/under-insured motorist coverage. Estimates are averaged for all 50 U.S. states and for different Rogue trim levels. Using a middle-aged driver as an example, Nissan Rogue insurance prices go from the cheapest price of $510 for your basic liability-only policy to a much higher rate of $3,030 for a high-risk driver policy. Living in a larger city can make a big difference on the price of auto insurance. More rural locations have more infrequent comprehensive and collision claims than densely populated cities. The ranges above highlight why anyone shopping for car insurance should get quotes for a targeted area and their own driving history, instead of making a decision based on average rates. The chart below breaks down estimated Nissan Rogue insurance rates for other coverage scenarios. Auto insurance prices for a Nissan Rogue are also quite variable based on deductibles and policy limits, your driving characteristics, and the model year and trim level. The state you live in plays a big part in determining prices for Nissan Rogue insurance prices. A good driver about age 40 could pay as low as $1,070 a year in states like Vermont, New Hampshire, and Missouri, or be forced to pay as much as $2,000 on average in Louisiana, New York, and Michigan. Since prices can be so different, the best way to figure out which car insurance is cheapest is to compare prices from multiple companies. 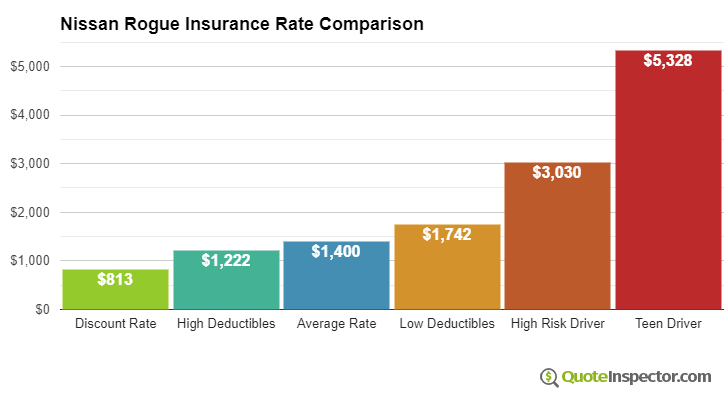 Each auto insurer uses a different method to calculate prices, and quoted prices may be quite different. Rates are averaged for all Nissan Rogue models and trim levels. Rates assume a 40-year-old male driver, full coverage with $500 deductibles, and a clean driving record. Getting lower rates on insurance for a Nissan Rogue takes having a decent driving record, having a good credit score, being claim-free, and qualifying for all possible discounts. Take the time to comparison shop every time your policy renews by requesting quotes from direct car insurance companies like Progressive, GEICO, and Esurance, and also from local insurance agencies. The following items are a quick review of the information touched on in the above illustrations.